ARTHUR, Amy E., 94, of Queens Manor, Liverpool, formerly of Milton, passed away peacefully in Queens Manor on Friday, May 28th, 2010. Born in Milton, she was a daughter of the late Roland and Margaret (Walker) Mansfield. Amy was an active member in the Milton Christian Church; Disciples of Christ serving in various capacities as well as being the first lady elder. 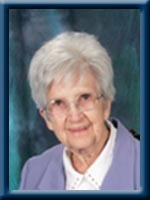 She loved to sew and to sing and will be fondly remembered as a loving mother and grandmother to her family. She is survived by her daughters Ruth (Dr. Stephen) Bedwell of Halifax; Jane (Thomas) Murphy of Kingston, ON. Her sons: Roland (Barbara Churchill) of Thunder Bay, ON and Gordon (Marsha) of Milton. Seven grandchildren and 9 great grandchildren. Her brothers Roland of Fredericton, NB and Clyde of Toronto, Ont. She was predeceased by her husband Harold, her son David, sister Ruth and brothers Herman, Lawrence and Roy. Cremation has taken place under the direction of Chandlers’ Funeral Home, Liverpool. Funeral service will be held Wednesday, June 2nd, 2010 at 2:00 p.m. in Milton Christian Church, Disciples of Christ. Reverend A.R. MacDonald officiating. Burial will be in Milton Community Cemetery. Family flowers only, donations may be made to the Milton Christian Church, Disciples of Christ. Online condolences may be made to www.chandlersfuneral.com. So sorry to hear of Amy’s passing, she was a lovely lady & will be missed. Thinking of the family in out prayers. Your Mom was a beautiful lady, who always had a smile on her face and it truely was a beautiful smile. Our thoughts and prayers are with you all at this time. Gordie and Marsha, Tom and Jane, please accept my sincere condolences on the passing of your mom. There is no other person that I can think of that was a more caring person than Amy. She was kind, generous always cheerful and never had a bad word for anyone. To me, if you were to look in the dictionary under the word “Sweetheart”, her picture would be there. May she rest in peace and God will surely bless her. Everyone loved Amy- A real pillar of our church. God will welcome her as one of his favorite angels.She will be remembered as a gracious lady and our community loss. we are sorry to hear of you loss. our thoughts and prayers are with you all. We were saddened to read of your mothers passing. She was a special person, mother and grand-mother. She loved you all very much. Remember the happy times and she will be smiling on you all. We were so sorry to read that your Mom had passed away.She certainly was a lovely lady.I so enjoyed my visits with her through work.Our thoughts are with you all at this time. I would like to extend my sincere sympathy to the Arthur family. Mrs. Arthur was a sweet woman and my favorite Brownie leader. I haven’t seen her in over 40 years but still have happy memories of her. May your memories help you through this difficult time. Gordie and Family,so sorry to hear of your loss.Thinking of you at this time of sorrow.May you cherish the memories of her forever. Sympathy is being sent your way in the loss of your mother, may God be with you and help you all through this difficult time. i was in hospital with amy, her mind wasn’t so good. but could sh sing. Amy was a dear soul. I can remember her from my early life when Harold was leader of the Boy Scouts. Will miss her smiling face at the Liverpool Manor when I`m playing. Sorry about your Mother.Remember her when i grew up in Milton. We are returning to Liverpool on Wednesday and will not be at your mothers funeral, but be assured that are thought and prayers are with you. Thinking of you at this sad time.Amy was a sweet lady.I always enjoyed our visits with homecare..and know she enjoyed them also. From Victoria BC where I am traveling, here’s to the end of a long journey gram. I will miss you. Gordie, Marsha & Family – Our sincerest condolences on the passing of your Mother. Our prayers and thoughts will be with you during these difficult times. Gordie, Marsha & Family, Sorry to hear about your Mom, she was a lovely lady. TO AMY’S FAMILY-SO SORRY TO HEAR OF AMY’S PASSING,SHE TRULY A LOVELY AND CARING PERSON!MY THOUGHTS ARE WITH YOU ALL AT THIS SAD TIME!! So sorry to hear about Amy. She was such a great lady. Always looked forward to our early mornin visit with home support…loved hearing her stories about Uncle Jordie & Gordie when they were younger!! She will be greatly missed!! To all of the Arthur family, your mom was a very special lady. She was my neighbor for many years, she was always there for me and always had a smile and a hug. My family loved her for her kind and loving way. What a beautiful ANGEL God has called home. Sorry to hear of your Moms passing She taught me sewing at night school years ago.Very special lady. God Bless to all her family. Our condolences to the family of Mrs. Arthur. She was a lovely lady. We are very sorry for your loss.Please accept our sincere sympathy at this sad time. Sorry to hear of your Moms passing. She was a great lady. God has called home another angel… Amy was such a beautiful person and will be greatly missed by all who were fortunate enough to have known her. I have fond memories of her from my days in Brownies, a long time ago! Amy was a lovely lady and such a pleasure to visit during the time that I was her Care Coordinator from Continuing Care. My deepest sympathy to the family. Gordie, our thoughts and prayers are with you and the family at this sad time. She was such a beautiful lady and we have such great memories at the family gatherings which she so enjoyed. She was a loving mother, grandmother and great grandmother and will stay in your hearts forever. Sorry we can’t make it to the service but we are thinking about you all. Please accept our condolences on the death of your mother. You remain in our prayers and thoughts. I had the pleasure of spending alot of time with Mrs Arthur, through working in the Recreation Department at Queens Manor, as you know Amy was the sweetest most delightful lady, I enjoyed the time we spent together very much. She sure loved her family and took great of pride in all of you. She has touched my life in a special way and will be dearly missed. Amy haas been a life friend. I used to like to visit her. She also always had a abible verse for roll call. She will alwys be remembered for her kindness. I had also traveled to work at the Mill with Arthur. My thoughts and prayers are with you all in this difficult time.